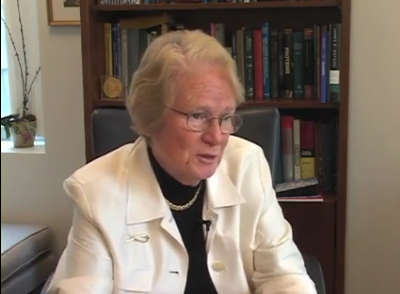 Oral history interview with Patricia K. Donahoe, M.D., director of Pediatric Surgical Research Laboratories and chief emerita of Pediatric Surgical Services at Massachusetts General Hospital, and Marshall K. Bartlett Professor of Surgery at Harvard Medical School. Dr. Donahoe's research interests include fetal inducers and regressors and their development as potential chemotherapeutic agents, the molecular and genetic causes of congenital diaphragmatic hernia, etiology and treatment of intersex abnormalities, and stem cells in ovarian cancer. Joint Committee on the Status of Women, “Oral history interview with Patricia Donahoe (video),” OnView: Digital Collections & Exhibits, accessed April 22, 2019, http://collections.countway.harvard.edu/onview/items/show/6017.